Romantic and peaceful, you can relax in our Kuhio Shores oceanfront condominium on one of the most beautiful and tranquil sea shores in the world - the Poipu Beach area on the sunny south side of Kauai. Pets and smoking are NOT allowed. Enjoy our newly remodeled and air conditioned, one bedroom, dwelling where the morning sun flows through the windows as you look out onto the ocean's breaking waves. From your private lanai, ocean and mountain views flood your sight, sea turtles appear among the rocks, local fishermen cast their nets, and whales can be seen during the season. Our condominium is located on the cool east side of the condominium complex, where can hear the sound of the waves rolling to the shore. Enjoy our newly air conditioned condominium. The condo is equipped to make your stay enjoyable. Available are boogie boards, snorkeling gear, beach supplies including chairs, umbrella, cooler, and towels, picnic supplies. Rice Maker, Beach mats, Ice Chest with Ice Packs, Body Boards (2) and fins. We absolutely loved our stay on Kauai and Kuhio Shores is perfectly located. It has the best snorkeling on the south side of the island where you can walk to the beach to get in. Nothing on Kauai is very far away. We had friends staying in a resort on the eastern shore and it never took very long for us to go either direction. We would definitely rent this unit again. I was surprised it had no washer and dryer. I had to go back and look at the listing and saw that I just didn't read it very carefully. I think I was too caught up in the location and that it was right on the water. The sound of water against the rocks was awesome! Beautiful view of Turtle Cove and sunny morning with coffee in hand.. Well appointed 2nd floor condo with a very comfortable bed, rockers on the porch and comfy couch and chairs. Modern kitchen with large refer and ice maker, plenty of storage containers and salt/pepper (only). Cons: needs a deep clean and more hand soap and shampoo provided. Have the housekeeping leave spices that others leave behind. Not a deal breaker and would stay there again in a heartbeat. Just good to know before you arrive. Thank you for your positive review. Watching the turtles from the lanai with coffee is also one of my favorite things to do! We strive to ensure all our guests have a memorable stay and appreciate your comments on areas in which we can improve. Don't get me wrong, it's a very nice condo, and if you're thinking of staying there, go for it. It's mainly in excellent shape, but a couple areas are showing their age and use, like the wooden cabinets and a wonky slider screen. We were also a little disappointed that some of the basic supplies were skimped on- there wasn't any dishwashing detergent, only one partial roll of paper towels, and barely enough soap to last the week (we ended up taking the hand soap into the shower the final two days). Condos we've stayed at elsewhere in the islands were quite well stocked in this respect. Thank you so much for taking the time to write a review. We appreciate the positive feedback as well as the areas where we can improve. In the future, we will work to make it clearer to guests that toiletries, paper products and other basic cleaning supplies will be available on a limited basis. 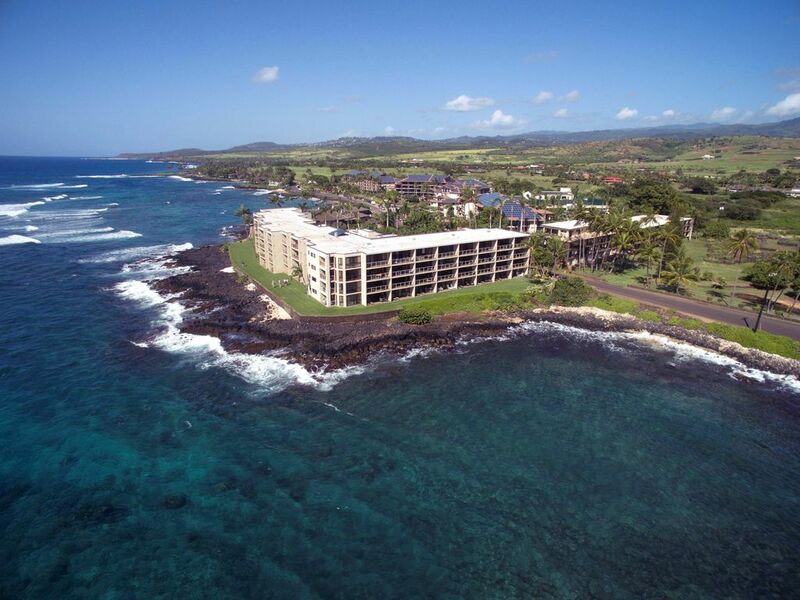 Great Condo with awesome location to snorkel and surf!! I loved everything about this condo. The location was great, the view was extraordinary, the unit was fully outfitted with everything/anything one might need, the furnishings were charming Hawaiiana, and the hostess was incredibly thoughtful. Can't wait to stay here again! Mahalo. So glad you enjoyed your stay. During our stay at Kuhio Shores at Poipu, the beautiful view of the cove from our condo's lanai became our gathering place each morning and resting place each night. The kitchen was stocked with all the utensils we needed. Meals were easy to prepare and everything was clean and organized. We enjoyed our stay with you in Kauai. So glad you enjoyed it. Thank you for your comments. Relax in our Kuhio Shores oceanfront condominium on one of the most beautiful and tranquil sea shores in the world - the Poipu Beach area on the sunny south side of Kauai. Few condominiums are built on the water's edge in Kauai, but our condo at Kuhio Shores is about as close as you can get. From the lanai of our second floor unit (#203), you are less than 50 feet from the rolling waves. Enjoy our updated oceanfront dwelling where the morning sun flows through the windows as you look out onto the ocean's breaking waves. From your private lanai, which is among the largest at Kuhio Shores, you can enjoy ocean and mountain views, sea turtles appearing among the rocks, and local fishermen casting their nets. Enjoy breakfast, lunch and/or dinner on the lanai and in season see the whales breaching while you dine.